In my pervious post I showed how to create a simple LCS scripted response bot that did something a little bit boring such as tell you what day it is. Presence technology is something that’s changing and growing all the time the Outlook integration of the Office 2005 communicator is one example. The script is partially inspired by this but I decided to see if I could push the limits when it comes to privacy and the presence type information that is available to system administrators that you may not think normally about using. 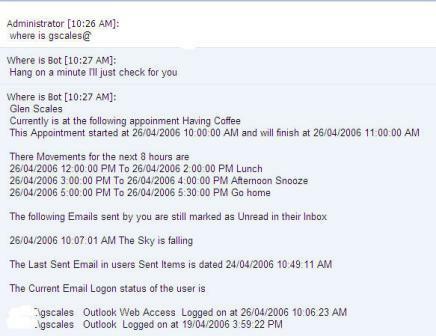 First it queries the calendar to see if they are currently in an appointment and creates a response that shows details of the appointment a person may currently be attending and the location that appointment is and what time it started and finished. It also sends a full list of their calendar appointments over the next 8 hours what time they start and finish and where they are located. After this it does a query of the users Inbox and looks for any email that the asker has sent to this user over the past 3 days and see’s if any of these emails are unread. If any of these emails are marked unread in the users inbox it creates a list of which email they are and responds to the requestor. The last query it does if for Exchange 2003 server only what it does is queries the Exchange_logon class to see if this user is currently logged on to the Exchange server anywhere. So basically it tells the users if this person is currently logged onto Outlook from a desktop or whether they are logged on maybe via Outlook web Access. An Example of the Output it returns looks like. All the mailbox queries are performed over WebDAV I’ve created two versions of this script one is for if your running FBA on the Exchange server and the other is a NTLM version. For the Logon status query I’ve used a version of one of my previous scripts that uses the ADO shaping data provider to shape ADSI and Logon Data from the Exchange_Logon class to show the logon status of the user. Because this script actually logs onto a users mailbox the script must filter out any logons that I picks up that the script has made. Because of the number of queries performed and depending on the number of items in a mailbox it can take a little time for all the queries to complete. To show a recognition that it has excepted the query it responds back to the user straight away that its checking and to wait a minute. To run this script can be a little tricky basically you need to configure the script with credentials to use to logon to LCS and logon to Exchange. I’ve used the same credentials for both LCS and Exchange meaning that the user who your are using in the script must have full rights to all the Exchange mailboxes that might be queried by this script. See this for more details on how to achieve this. One note if your running the FBA version and you have a fount end server you might want to hardcode the name of the fount end server in the script. This can be important if you have used an alias in your SSL certificate which would normally cause a SSL certificate popup which will cause the script to fail. To hardcode the server name just un-rem the following line of code and configure the variable. After you’ve configured the script all you need to do is start it from the command shell like. The script is very verbose and should return a lot of information back to the console while it’s running. Continuing on from the other week I’ve been playing around further with the new Ajax interface for LCS communicator web access. Response bots are not only a lot of fun to play around with but can be a practical way of getting a little bit more out of an Instant messaging system. Like the send message script this script works by using the browser object to post and get data to the LCS Communicator Web Access server. The script is a little crude in some aspects for some reason the XML returned from LCS does seem to parse well so I’ve used a cruder text parse method to interpret the server responses. I have really only tested this in one environment so this logic may fall down in other environments where there are some differing variables. The first section of the script logs on to the web access server using NTLM over https and most importantly retrieves the latestupdate id which must be posted with every request to the server. The reasons why you need to do this and how the timeouts work is all explained in the AJAX SDK which you can download. Do a search on “latestupdate” if you want more information on this. So after it retrieves the latest update it basically setups up a never ending loop where it continues to poll the server until the script is broken or a error is encounter. When someone sends a message to the scripts LCS account the next time an update is polled via the script the message itself gets parsed from the message attribute which is part of the response. For this basic script it looks to see if the message is “what day is it”. If there is a match then it uses a few VB functions to get the weekday name and the send a message back to the IM session that initiated the question. To target the right IM session for the response the IM session ID must be parsed out of the response string and used in the LcwSendMessageRequest method. Like the send message script the cookie that is retrieved after logon must be sent with every request. The script is very verbose and should return a lot of information back to the console while its running. ",X-MMS-IM-Format: FN=Arial%253B EF=%253B CO=000000%253B CS=1%253B PF=00"
One thing that I seem to do with monotonous regularity is disable user accounts as people churn though the companies that I work for. Usually once an account is disabled the chances of it being re-enabled while possible are always slim. One of the things that mostly gets forgotten when disabling an account is to also remove it from any distribution lists that account maybe in. Now with the new hot-fix this is not as much of a problem because a disabled mailbox can now be configured to still receive email. However it is still desirable for these disabled accounts not to be receiving email from distribution lists. Instead of going though each disabled user to work out if it’s a member of any distribution list and then remove it I decided to create a script that would fist let me list all the disable users that are in a distribution lists and also have an option so it will remove these users from that group. The display section of the code then just looks at groups with at least 1 disabled user as a member. Some extra code is added to skip the system mailboxes and some ADSI code also is used to remove the user from the group if the script is being run in remove mode. strConnString = "Data Provider=NONE; Provider=MSDataShape"
" RELATE GRPDN TO USGRPDN) AS rsGRPUS "
Its been some time since I had a chance to play around with any LCS code I saw the release of the AJAX SDK so I decided to have a bit of read and see if I could put together a few bits of code. If you’re comfortable writing WebDAV code you’ll feel at home with Ajax its just a matter of posting and getting data via a Http control. Starting real easy I thought I’d try a simple VBS script to send a message from the command line. Logonstr = "https://" & Servername & "/iwa/logon.html?uri=" & LogonSipAddress & "&signinas=1〈uage=en&epid="
Messagestr = "cmdPkg=1,LcwStartImRequest,sip:" & ToAddress & "," & Message & ",X-MMS-IM-Format: FN=Arial%253B EF=%253B CO=000000%253B CS=1%253B PF=00"